Keep stagnant water healthier and cleaner for fish and local wildlife by adding a pond cleaner that breaks up waste, bacteria and algae. Whether you've got a koi pond in the backyard, a barrel of water for your cows, or a pond you like to fish in on your property, it's important to keep it clean and clear for the health of your fish, livestock and local wildlife. And thanks to Bio-Zone Pond Enzyme Treatment, you can reduce waste, bacteria, algae and other buildup so water is cleaner, healthier and less polluted. Crafted using all-natural barley, our ecofriendly formula helps break down dead algae and fish waste to reduce cloudiness and sludge buildup. Safe for plants, fish, and animals of all shapes and sizes, you can keep up to 15,000 liters of fresh water clean and clear with Bio-Zone Pond Enzyme Treatment. Click 'Add to Cart' now to get a complete cleaning and clarifying formula for your pond and reduce waste, bacteria and algae up to 15,000 liters. CLEAN & CLARIFY - A unique formula that breaks down sludge, bacteria and waste, it helps clear up cloudy water and reduce algae that makes water murky. ELIMINATE ORGANIC WASTE - The Bio-Zone formula helps eliminate the buildup of fish waste, algae and bacteria to reduce "green" water tops. SAFE FOR PLANTS & WILDLIFE - Bio-Zone is completely safe and ecofriendly for fish, plants, water, toads, and other local wildlife. 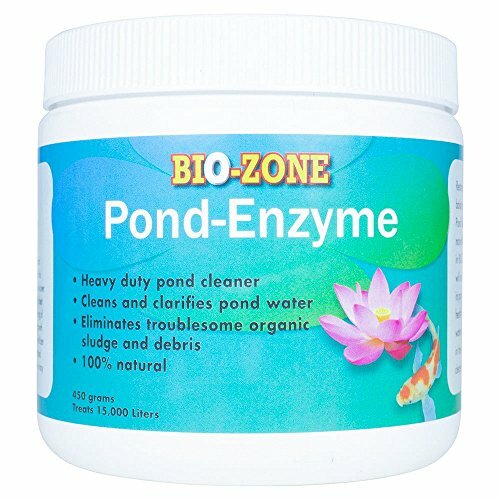 NATURAL FORMULA - Backed by all-natural and organic barley, our pond enzyme is a heavy duty pond cleaner and clarifier that's safe and healthy. HOW TO TREAT POND - Use one scoop from 60 grams to treat 2000 liter, it is about 528 us gallon (scoop is included), twice a week for the first two weeks in ornamental ponds for start-up season, and end of season, then start using once every two weeks for regular maintenance. LARGE TREATMENT AREA - This pond cleaner enzyme lets you treat, protect and fortify up to 15,000 liters of water in ponds, fish tanks, and aquariums. try it, it is risk free, for 90 days of purchase if for any reason you didn't like it you will get a refund without any hesitate only by manufacturer creme dingenue inc.. If you have any questions about this product by Bio-Zone, contact us by completing and submitting the form below. If you are looking for a specif part number, please include it with your message.